The EZ curl bar is definitely one of our favorite bars to use for specific exercises such as bicep curls obviously, but also for skull crushers and even deadlifts. Yeah, you never would have guessed that it’s a great way to make your deadlifts feel easier on the grip, right? Anyways, if you are looking to get your hands on the best EZ curl bar you are in luck. We have looked at the top 5 EZ curl bars you can find online at the moment and have the brief of our findings down below. For more of my recommendations, have a look through these popular KickAssHommeGym guide links: Best Budget Olympic Barbells, Rubber Dumbbells. If you have your own little home gym setup chances are you already own at least a couple of straight bars. So why would want to get another bar? 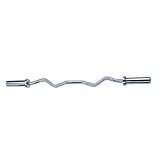 Well, the EZ curl bar, just like the triceps/hammer curl bar is optimal for performing specific exercises. The main advantage of an EZ curl bar over a straight bar is that it will allow you to experiment with different grip positions. All while taking away the tension a straight bar puts on your wrists or elbows and shifting that towards your muscles. This small tweak – hand placement & grip – will isolate specific muscle groups even more. So if you don’t really find a comfortable grip on the straight bar or you don’t seem to feel sufficient activation in the muscles you are trying to isolate, give the EZ bar a try. The 1-inch sleeves used for the regular size weights. Another aspect to consider when picking the sleeve size is the amount of weight you plan on using. 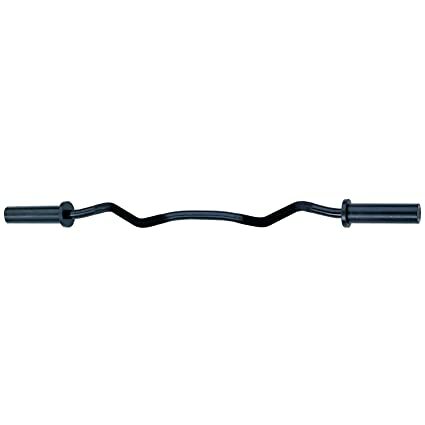 Typically 1 inch EZ curl bars will not hold more than 160 – 200 pounds, so if you plan on loading up the bar more you may want to consider an Olympic EZ curl bar. Lastly but not least regular size EZ curl bars are significantly cheaper than the Olympic ones, so definitely add that to your decision-making list. The quality of the knurling is going to greatly affect how strong your grip will be. This is particularly important if you are using heavy weights and also plan on using the bar on pulling type of movements. A better knurling will require less forearm activation and will allow you to focus more on the biceps or triceps instead. You also want to get a bar which has the knurling running throughout the entire length of the bar. This way you’ll have more room for different hand placements. 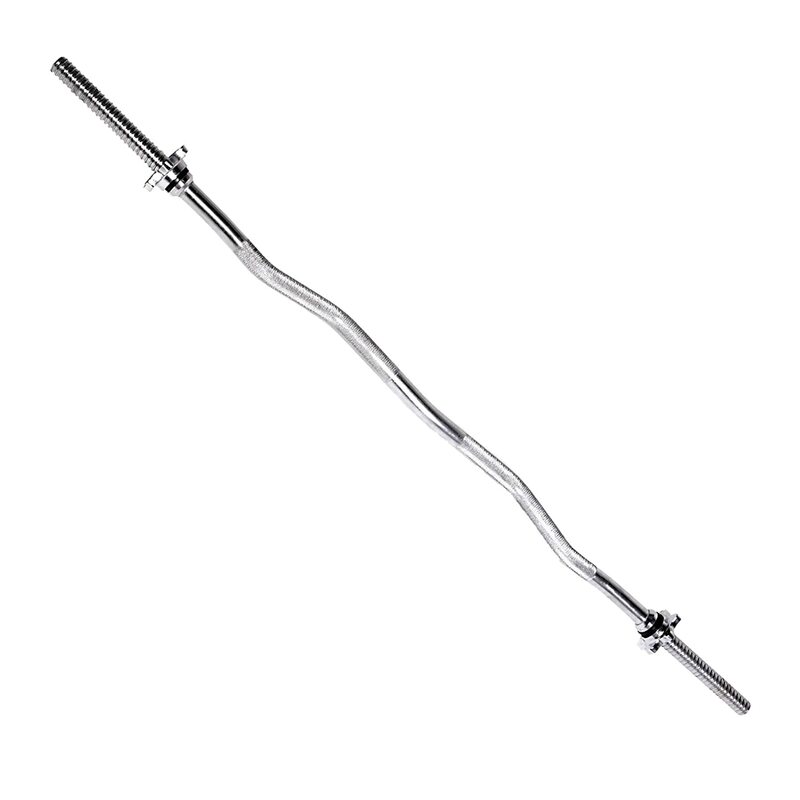 The reason for getting an EZ curl bar is to take away any unwanted tension that a straight bar puts on the wrists or elbows and put it on the muscles instead. The amount of bent (or the angles) of an EZ curl bar will determine the effectiveness of the bar in this regard. Different vendors will use slightly different angles. You may want to look into that as well and pick a more mellow or a more pronounced bend depending on what feels better for you. Lastly but not least, if you care about the looks of your EZ curl bar and how well it will hold over time you want to look at the finish. 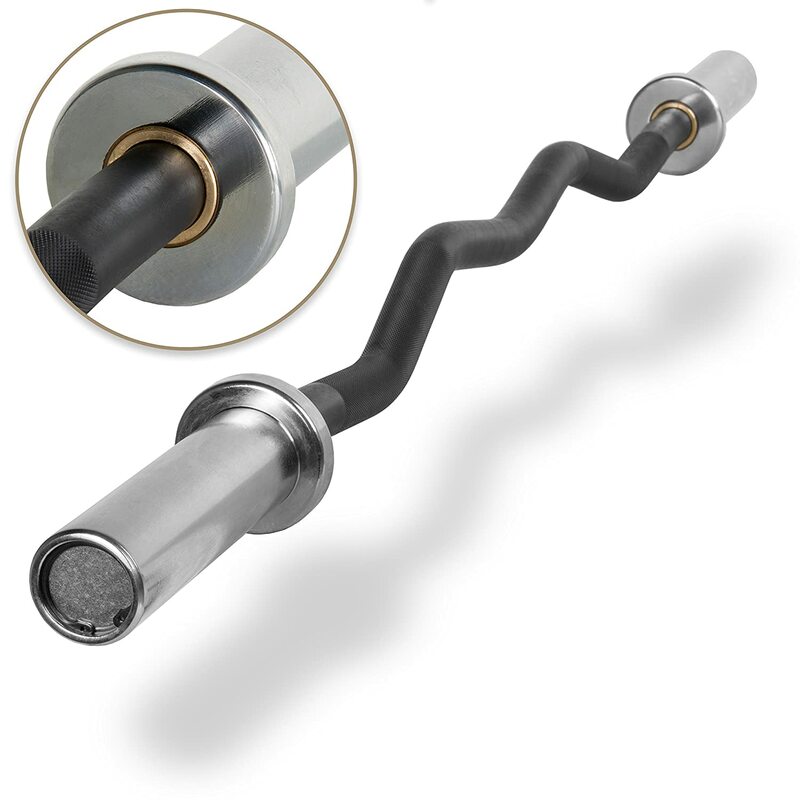 Most EZ curl bars come with a chrome coating, but you also have the option of getting a black EZ curl bar. The issue that many products have is that the coating rubs off easily even after just a few workouts. So check out our findings below to see which products have this issue and which don’t. The 28 mm grip on this EZ bar combined with just the right angles makes this bar very comfortable to use. Most of the stress is transferred from the joints to the muscles so you’ll be able to get in a more effective workout. The bar weighs 22 pounds which makes it a couple of pounds heavier than your average EZ curl bar. The sleeves are 2 inches and they will take Olympic plates. Speaking of the ends, these are rotating so you would get any additional discomfort from the plates turning the bar as you do your curls or skull crushers. The knurling on the bar is really good – not too heavy to hurt your palms, but just enough to give you a solid grip. It’s worth mentioning though that there is absolutely no knurling on the center of the bar. So if you are using a narrow grip you may find the bar being a little bit slippery. The XMark EZ comes in black or chrome, but apparently the finish is lacking a little bit. The chrome coating rubs off fairly easy and the black version is not doing any better either. If you are looking for a cheap regular 1 inch sized EZ curl bar, the Champion Barbell is one of the products to consider. Even if the seller doesn’t specifically mention this, the package might contain a pair of spring collars. We’re saying “might” because not all users got these in the package. Speaking of packaging – there seems to be a common issue with the actual contents of it. Many buyers reported missing components such as getting just one spring collar or getting both collars but not getting the barbell at all. 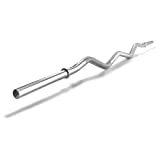 The angles on this EZ curl bar are more mellow than you would see in other similar products, so it might be a good choice if you are after that kind of bent. The knurling is really good, so you will get a solid grip. Unfortunately, it doesn’t run that much towards the center of the bar, so you will have to stick with a wider hand placement. The bar itself weighs 10.7 pounds and it is rated for 160 pounds load using regular sized plates. The finish is better than in most products and the whole barbell is made out of just on single piece of steel. This will definitely minimize any noise coming from different components. It comes in a chrome finish which looks better than the competition as well. The Titan 47” is one heavy duty EZ curl bar which will hold your 2-inch Olympic plates nicely. It’s quite a little bit longer than most bars which makes it great for taller users or for performing exercises such as upright rows or close grip bench press. Just by looking at how this bar was put together you can tell it’s a premium quality product made to last. The coating looks and feels really nice and the sleeves are firmly attached to the bar. The knurling goes really deep into the steel and allows for a firm grip. The sleeves are rotating which will give you extra comfort once those bigger plates start spinning. Speaking of comfort, the angles on this one are sharper than your everyday EZ curl bar. So if you are looking for that kind of grip you might want to give this one a try. It doesn’t come with spring collars and the finish of the sleeves is really slippery so you might want to get a pair of collars as well. The CAP EZ curl bar is one of the best-selling products in its category. It’s an EZ curl bar which will accommodate 1-inch plates so make sure that matches the weights you’ll be using. Even though the manufacturer didn’t include this information (that’s odd), the bar weighs around 10 pounds. There’s also no official information about the thickness of the grip. The bar comes with collars that spin/screw on the bar to secure the weights. This can be pretty inconvenient and time-consuming if you are changing the weights a lot during your workouts. On top of that, the collars don’t really seem to do such a good job at keeping the plates still. The amount of bent used in this bar is not as dramatic as in other similar products, but the angles definitely do their job and will protect your wrists and elbows. The knurling is great and it covers most of the surface of the bar. So regardless of how close or wide apart your hand placement is you are good. As far as the finish and overall built quality goes, you will not be too impressed. 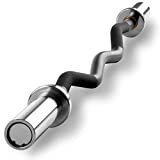 This EZ curl bar doesn’t look anything near premium quality and you may even notice small pieces of chrome coating coming of the bar as you screw and unscrew the collars. 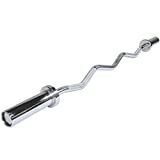 Lastly but not least we’ve added to the list another Olympic sized EZ curl bar which comes in black and chrome. However, you may want to stay away from the black version. Many users have reported rusting issues after a short period of using the bar or even for brand new products. On top of that, there are changes to receive a product with excessive oil/grease around the sleeves. So getting the chrome version will save you of all these problems. The angles are not as sharp as shown in the product images. This is not necessarily a bad thing as the bar is still comfortable to use, but it can be misleading. So if you are looking for a more dramatic bent bar this is not the best choice. The knurling is good enough for a solid grip and the sizing of the bar will fit most users and allow you to perform a variety of exercises without any issues. The spring collars are normally included in the package, but many users have reported missing parts after checking their package. So don’t be surprised if you don’t get yours or you get only one. An EZ curl bar is a nice add to your home gym setup. It doesn’t take up much space and it won’t cost you a fortune. But it will take care of your joints and allow you to focus more on isolating smaller muscle groups during your workouts. 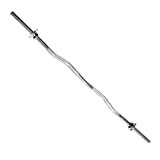 If you are searching for an Olympic size EZ curl bar, your best choice would be the Titan 47″ – great quality and nice angles. But if you plan on using regularly sized weights we recommend the Champion Barbell. Despite the packaging issues, this product will give you the best bang for your buck – good angles and very good finish.